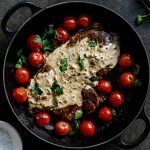 Easy creamy pepper sauce is the perfect accompaniment to a juicy grilled steak and takes only a few minutes to knock together. Melt the butter in a frying pan then add the onion and saute until soft. Add the garlic and cook for another 30 seconds before adding the pepper and herbs. Gently toast the pepper until fragrant then pour in the cream. Season with lemon juice and salt and allow to simmer gently for 10-15 minutes until the sauce has reduced and thickened to your preference.